Boot Droid X2 into Recovery Mode. In the following simple solution, I show you one way to get to System Recovery Mode on a Droid X2. 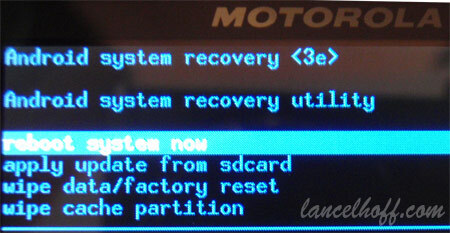 The System Recovery Boot Menu on a Droid X2, effectively enables you to apply updates from the sdcard, wipe data, perform a factory reset, and wipe the cache partition. Particularly useful when installing custom Roms, reinstalling stock Roms from sdcard, and for situations when you need to return your phone to factory condition before selling it. Push and hold Power + Volume Down while powering up, until “Fast Boot” appears at the top of the screen, then release both buttons. Push Volume Up to select. Push and hold Volume Up + Volume Down to access the Recovery Menu. Now simply use the Volume Up and Down buttons to scroll. Use the Power button to execute your selection.